The Lynda Fairly Carpinteria Arts Center depends on your financial support to fund exciting arts programming, including art exhibitions, gallery receptions and juror talks, community events, live music, poetry, films, workshops, and art experiences for children, as well as ongoing operating expenses (property taxes, insurance, utilities, etc.). Scroll below for options to become a supporting MEMBER and/or to DONATE! You can help make the Arts Center a place where creative, state-of-the-art, imaginative arts programs are available for ALL local children, seniors, and adults. 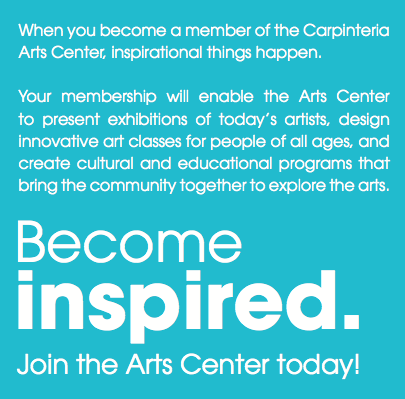 Our vision is that the entire community of Carpinteria - and those who love to visit here - consider the Arts Center a great place to explore the arts. We are working hard to serve the community and we are poised to grow into the future in exciting new directions. Thank you for supporting us! Your gifts are tax deductible to the full extent of the law.